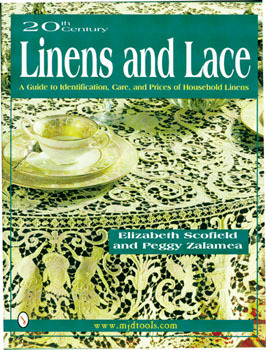 Dimensions: 9 7/8" x 11 1/4"
The exquisite and beautiful everyday linens and lace photographed for this book represent collectible household styles made in Europe and North America during the Twentieth century. Included are both rare and common examples so that readers can learn to differentiate between the two groups. This visually exciting book contains breathtaking photographs, from over-all room settings to minute details. The chapters are organized by types of work, with each type explained with origins and copies liberally discussed. It includes a price guide which is a valuable tool for this expanding field of collectibles which seem to be undervalued when the quality and supply of fine examples are considered.This superbly illustrated and well-documented book is a great buy for any collector and is sure to be an interesting read for everyone.